Ceramic Trimmer Capacitors suit telceom/microwave projects. Measuring 0.177 x 0.126 x 0.059 in., SGC3S Series surface-mounted devices are constructed with high-temperature liquid-crystal polymer housings that resist penetration by dust and flux. Housings are also colored to identify 5 available capacitance ranges from 1.2-3.0 pF to 8.0-30.0 pF. Designed for reflow soldering, RoHS-compliant units are suited for designs requiring minimal capacitance drift over operating temperature range of -25 to +85Â°C. April, 2008, Westbury, NY - Sprague-Goodman Electronics, Inc. of Westbury, NY, USA, has added a new line of ceramic trimmer capacitors designed for telecom and microwave projects requiring miniature components. Designated the SGC3S Series, these super thin surface mounted devices measure 0.126 in (3.2 mm) W x 0.177 in (4.50 mm) L x 0.059 in (1.5 mm) H and are RoHS compliant. They are constructed with high temperature liquid-crystal polymer housings for superior durability and low dielectric loss. The housing is constructed to resist penetration by dust and flux, and is colored to make each of the five available capacitance ranges easily identifiable. The parts are ideal for designs requiring very minimal capacitance drift over the operating temperature range of -25° to 85° C.
The trimmer capacitors were designed for reflow soldering. They are available in embossed carriers, 1,000 pieces per 7 in (18 cm) reels, making them well suited for placement on boards with automated pick-and-place equipment. Unit pricing for 1,000 piece quantities is $0.32 each. Initial quantities are available from stock. Contact: Marty Markson at Sprague-Goodman: Tel: 516-334-8700, ext. 20, e-mail: mmarkson@spraguegoodman.com. 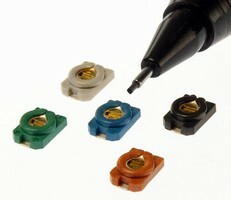 Hi-Rel SMT Packages feature rugged design.